Did y'all think I died? Well, of course you didn't. Thanks to Facebook and the like, there's no hiding in the bunkers. I'm going to get right to it. This is my last post on this blog. Yup. We're done here, and moving on to something new (which I will get to). This is an auspicious day. 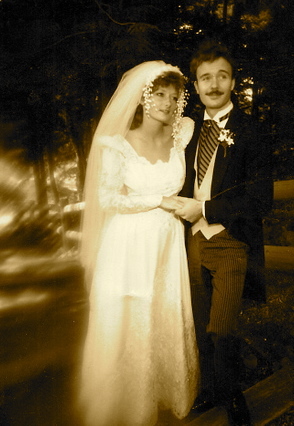 August 10th, 30 years ago, I became Suzy Vitello and banished forever the last name with ten letters that nobody could pronounce. Just look at me. Innocent, virginal (okay, maybe not), but damn, I had no idea, at age 24, what lay ahead. I mean, who does, right? Frank and I wouldn't even make it to three years, as a couple, due to the unforeseen circumstance that took his life, but he gave me two wonderful children in those brief years, and a name I love. I've been thinking a lot about the chapters in my life, and how they all seem to have their own little arcs. Ups, downs, new adventures born of out-of-the-blue circumstance. So, what's up? Well, life has thrown me a bit of a curve ball again. Certainly nothing as dire as young widowhood, but it looks like my publisher won't be picking up my next Empress book, and I'll be putting it out myself. I have many readers anticipating the second book, and I feel (and my agent agrees) that it would be a shame to lose the readership and momentum I've been trying to build this past year-and-a-half. The second book is called The Keepsake, and it's finished. I am fortunate to have a street team assembled to help with the physical aspects of format/copy edit/cover. (Thank you Laura Stanfill and Max Fulton and Kit Foster!) And I'm pretty sure you all will be hearing from me in terms of helping to get the word out. Now that I've been flung into the world of the "hybrid" author (and after several days of stunned sadness, I must be honest), I'm doing what I've done on the heels of other of episodes of misfortune: taking a deep breath and leaping into uncharted, scary territory. First step, is to better organize my backend (ha! both digital and physical - I'm on day one of a cleanse!) and that means scrapping my bug-filled, complicated website for a newer, cleaner, more modern one. I loved all my curli-cues and fancy wallpaper in the old site, but the interface is ridiculous, and it seemed too hard to tear that one down, so I just started from scratch. I'm very tight on the cashola at the moment, so I'm doing all of it myself, and I have to give a shout out to this guy, Tyler, who I googled up, and who youtube step-by-stepped me through the dev of my work-in-progress. In about a week or so, I hope to migrate everything over, but if I haven't worn you out yet, come on over to my OPEN HOUSE! Thanks, you guys, for hanging out with me lo these many years. Hope you'll keep in touch!